Elantec is committed to bringing you the best quality assurance as we spare no expense in introducing the latest precision calibration equipment, including Two-dimensional and Three-dimensional CMM, Profilometer, AirGages, Hardness tester, Precision instrumental gauges, that help to ensure all products fully meet your specifications, to your ultimate satisfaction. 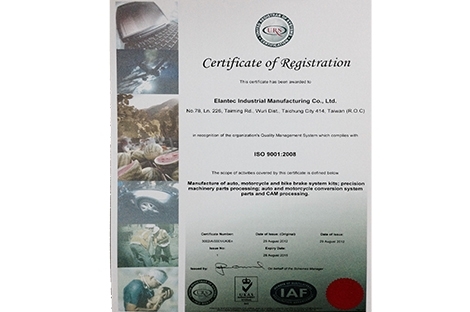 Upholding its persistent production goal in producing products of the finest quality, Elantec Industrial Mfg., Co., Ltd utilizes the latest innovative production technology and state-of-the-art equipment in its production manufacturing that ensures perfection in everything it produces. Moreover, Elantec also has access to several key manufacturing techniques that it utilizes through fully and semi-automated precision equipment, which include High-Speed lathe, CNC lathe Broach fully computerized that help to achieve a reliable quality level in steady production.